Did you know that we offer financing, so that you can finance your tempering machine purchase at http://www.chocolatetemperingmachines.com/ (financing available on all purchases over $99.00!). We now offer financing through Paypal "Bill Me Later" (this is a VERY popular option as they offer "no payment" and "no interest" financing options!!). 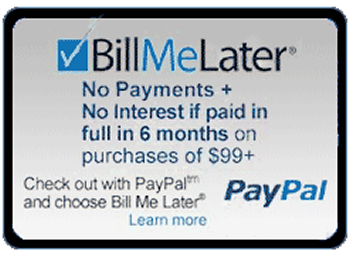 To checkout using "Bill Me Later", you must add the item(s) you wish to purchase to your cart by clicking "Order Now"
Once you have added all items to your cart, click "checkout with paypal" and you will be redirected to paypal.com. Once there they will give you the option to pay with "Bill Me Later". If you choose that option, it will take you to the page where you can apply, and if accepted to accept their terms of financing. Once completed your order will be submitted to us for immediate processing and shipment (and you will receive separate emails from Paypal regarding your Bill Me Later financing).